“I think it’s worth it to declare Jesus to these people…” said John Chau, the young man who was killed as he went courageously to share Jesus with an unreached people group. Was he foolish or brave? If we think he’s foolish, we have sorely forgotten what our Bible says about sharing the Gospel! Don’t miss it today. It is worth it. This is Heidi St. John welcome to the Heidi St. John podcast. Today is Friday November 30th. 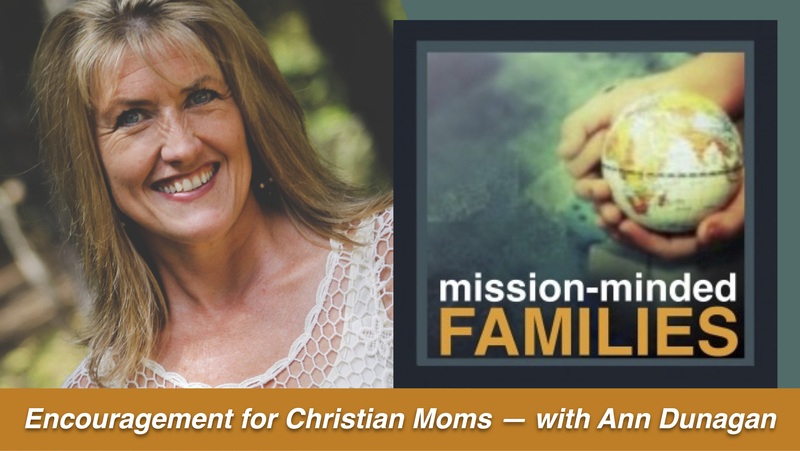 It’s meet-my-friend-Friday, and here at episode number 695 and as promised,my friend Ann Dunnagan, the founder of Daring Daughters, and the host of Mission-Minded Families is here in the studio with me today. We’re going to be talking about the recent death of a missionary to a Sentinel Island Tribe, Jonathan Chow. Some of you are familiar with that story and it’s both inspiring and a good opportunity for us to talk about the importance of spreading the Gospel. Stick around, I think you’re going to be encouraged. All right. So here we are at the end of November. You guys know I love this time of year. I hope that you are enjoying the season with your family, and really focusing on what God is doing both in your family – and around the world. God is always at work and He is at work here at MomStrong International. 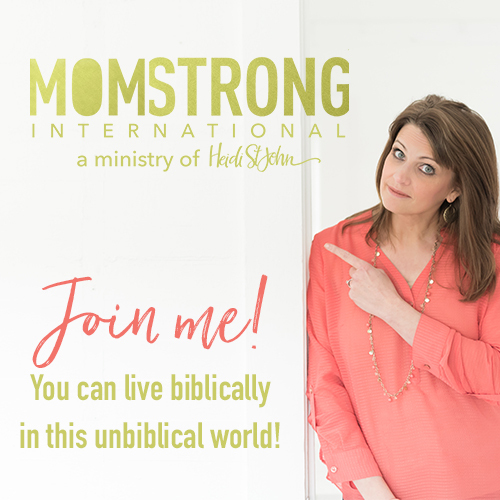 If you have not yet become a member at MomStrong International – I want to really encourage you to do that. It’s a great Christmas gift, by the way! – to just really encourage another mom to be in the word this year. That’s really my heart is to see you get into the word and walk with God and follow Him with really an abandoned – that sets the next generation on fire for the Lord. And that’s the thing I love so much about my friend Ann. Ann Dunnagan is in the studio with me today. Ann directs Daring Daughters. And she’s the host of the Mission Minded Family Podcast. She’s a mom of seven kids who are all homeschool graduates right now. And she’s got grandkids coming out her ears, and I just love her passion for the lost and for families. Ann welcome, I’m glad you’re here. [Ann Dunnagan] Thank you, Heidi, I’m excited to be here! [Heidi St. John] It’s nice to have you in the studio we’ve been friends for a long time but I think this is your first visit to Firmly Planted, yea? 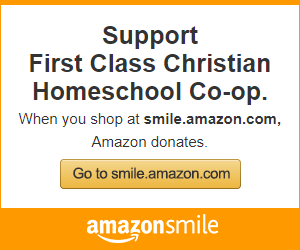 [Ann Dunnagan] Yeah, this Firmly Planted Homeschool Resource Center is amazing! It is so much bigger and more glorious and just all of the life and the joy in this place is and it’s just beautiful. [Heidi St. John] Thank you. [Ann Dunnagan] I’m so impressed. It’s probably ten times bigger than I imagined from your Facebook posts and videos. 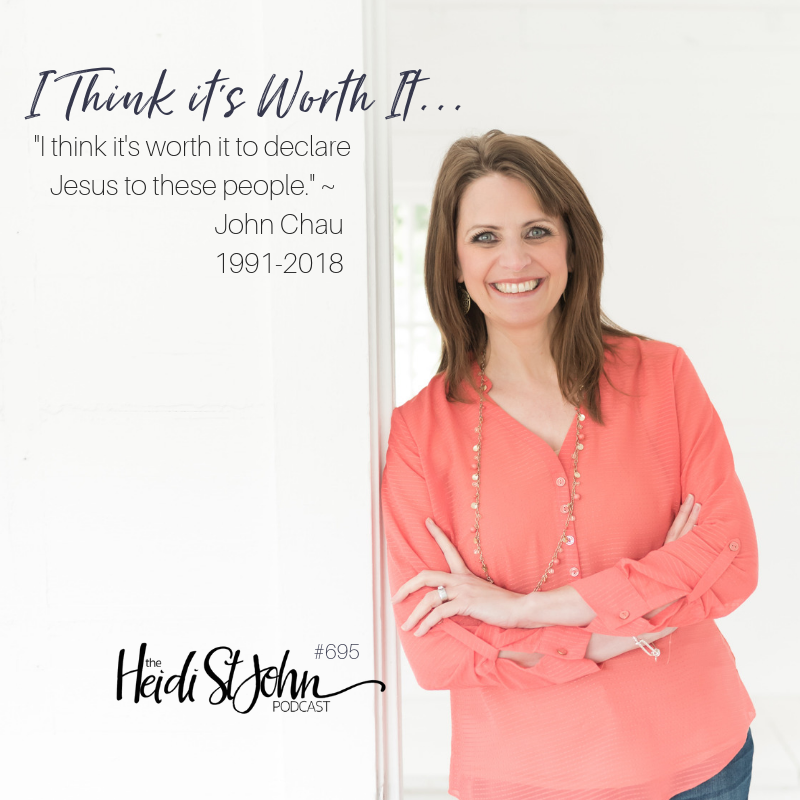 [Heidi St. John] You know, I can’t really do it justice on Facebook – but you and I have been talking a lot about just the grace of God and how He equips us and calls us – and that this place is like that. And you have been the recipient of an extravagant grace, because every time I look at the things that your family does at Harvest Ministry, and your kids walking with the Lord now, and the books that you’ve written – I’m always encouraged. And I thought it’d be fun, for the listeners here, who have never heard of you to just give a little bit of Ann Dunnagan 101. So you don’t live too far from me, actually, which is why I got to have you in studio! [Ann Dunnagan] Yeah, I’m just an hour and 15 minutes away, near Hood River, Oregon. My husband and son Mark, an adult son, they are actually over preaching today in Uganda at a ministers conference with pastors and national ministers from six nations across East Africa. Ministering in our children’s home over there a good many Guma Na Yesu Children’s Center (which means: Keep with Jesus). And they’re just having a fabulous time. And like you mentioned we have seven kids and they are being fruitful and increasing so we have four of our kids that are already married, and a daughter that’s going to be getting married in a couple of weeks, and we are going on 13 grandbabies. [Heidi St. John] Oh my goodness! It’s like grand babypalooza. [Ann Dunnagan] Yeah. That’s it! It’s really cool when you think of where it’s your children are then having children. It’s like you know that’s what we are trying to do with, you know, with being a Christian and in the body of Christ – is that we are to raise up other people who will raise up others. And you know, train those who will train others, and disciple those who will disciple the next generation – and that’s what I love about this Homeschool Resource Center is you just really have such a heart for this generation. You know even the next generation of homeschoolers – it’s very exciting! [Heidi St. John] Well I think it’s easy for us – you know you know I’ve had this conversation many times – it’d be easy for us to sort of cocoon ourselves, right? and just look at our own family and what we’re doing – and really, God is at work everywhere. And one of the things I love about you is that you’ve taken the heart of the Gospel, a great commission, and you’ve actually put feet to it. So Harvest Ministry is the ministry you and your husband started this right? [Heidi St. John] So that’s that’s a long time of faithful mystery. How many years have you been married? [Ann Dunnagan] We have been married over 33 years, and as a family, we have reached and shared the gospel into over 100 different nations all over the world. Our son and daughter in law just got back from Southeast India and Nepal – where their ministry and our ministry together founded a brand new children’s home there, Himalaya Daya, a Children’s Rescue Home. And anyway, it’s just very very exciting! [Heidi St. John] It’s wonderful. In your heart, in The Mission-Minded Child, because we’re going to talk a little bit about The Mission-Minded Child. You wrote The Mission-Minded Family and The Mission-Minded Child and you really have a heart to see parents equipping their children to have a worldview that doesn’t just include themselves! [Heidi St. John] Right – beyond what the culture, especially here in the United States, beyond what we tell our children. And that’s really kind of the heartbeat behind The Mission-Minded Child – because I want to get into a little bit of the meat of why you wrote The Mission-Minded Child and then I’d like to kind of transition the conversation to talking about Jonathan Chow – this young man who – from here, from Vancouver who lost his life recently sharing the Gospel, and kind of get your thoughts on that. When you wrote The Mission-Minded Child, because I know there a lot of parents who are listening to this who have young children at home. So, maybe they’re a parent who has a young very young like a newborn at home, or an 8-year-old, or a 10-year-old, 12-year-old – and they’re trying to live out the gospel in such a way that their children will want to live it out and their children beyond them because it’s really generational. What’s the heartbeat behind The Mission-Minded Child? And we like to tell our children, like- Do you get it? – or if they have a really close friend or a romantic interest – it’s like – OK, do they get it?. Like, do they get what the kingdom of God is all about? [Heidi St. John] and three of your kids knew him right? [Ann Dunnagan] three of our children knew him and you know had taken classes with him. [Ann Dunnagan] I have many different friends that that knew him and – just were very impacted by his life. You know I didn’t know him personally. In generations, there are always frontrunners that go and take the gospel and take risks. I mean, throughout our lives we have taken the gospel into many different places. We smuggled Bibles into China. That was not – you know, we disobeyed the rules to do that. We actually once got caught and brought down and got in trouble and hid in a border as we were trying to smuggle Bibles into the underground church in China. We’ve had times where – sometimes in certain situations, we kind of think of you know – sometimes you ask for forgiveness you don’t ask for permission because you just want to go and preach. [Heidi St. John] Yeah, they’d been on his heart. [Ann Dunnagan] He was 26 when he died but it was probably seven to ten years that he had been praying and interceding for that group. [Heidi St. John] So for people who aren’t familiar with the story, really quickly, I don’t know how you can’t be, but I’m sure there are a lot of people who weren’t in on the news. John Chau is an American missionary, and he was killed in a hail of arrows last week when he set foot on, North Sentinel Island and he believe that God sent him there. And he wrote it, we have copies now – they’ve been printed of his journals. He went, I think he went the day before, right, and a young boy on the shore shot an arrow at him. And according to John, it hit his Bible. [Heidi St. John] it hit a waterproof Bible and he wrote about it. I know my daughter, Sierra, who knew him, read this to me for a couple days with just tears in her eyes. “Mom he just loved the Lord and he knew that God had called him there”. He wrote that right before he arrived on North Sentinel Island. So he understood the dangers he was facing. What do you say to the parents who are listening? They’re thinking about their own child, right? I mean you’ve had children that have gone onto the mission field. A lot of us are just you know terrified at the thought of sending our children out there. And you know, you’re right he has received a fair amount of criticism. But I keep I keep hearing Jim Elliot in my head. And how years ago where Jim Elliot and the other missionaries that went into that Huaorani – it was that called the Auca tribe. But now it’s called the Huaorani people – but it was Jim Elliot, Pete Fleming, Ed McCulley, Nate Saint, and Roger Youderian, they were missionaries that were martyred in Ecuador in 1956- in a very similar sort of thing. [Ann Dunnagan] Through Gates of Splendor, she wrote Passion and Purity – but she took the story of her husband and she then shared that story with the next generations. And I really think just as we are, you know, seeing the situation that happened with this young man, or as we are recalling missionaries of the past and what they have done – is like – What are the stories that we are telling our children? And, are we reading the missionary stories and highlighting these people that had would have the courage to go and to take the gospel to unreached people groups. You know, he wanted to see this tribe in heaven. And I tell you with it being all over the news – it is stirring up just even a debate and awareness inside of the Christian circle that, you know – Do we really need to go and take the gospel to people who have never heard it before? Some people don’t think that. That was almost word for word like what was spoken to William Carey years ago when you know he was just this passionate young man with a heart to go and share the gospel with unreached people in India. And the older preachers of that time, and this was back in 1792, right around that time. Sit down young man you are just an enthusiast. When God sees fit to convert the heathen He will do it without you or without me. Well like it was almost word for word what I read the other day in a Christian homeschool circle. [Heidi St. John] What goes through your head when you hear people say that? What’s your first reaction? My first reaction is: We’re not reading our Bibles. [Ann Dunnagan] My first reaction is just – we are obligated to share the gospel with those who have never heard it before. And and I don’t see it as like – you know, you have to do it – like you have to read your Bible, you have to go to church, you have to do this. It’s your obligation. You know – you have to clean your room. You know, you gotta do it. I see it as when there is a burning passion in your heart out of just this love that – I love the Lord, and I know that he loves people and he died on the cross for our sins and that he wants for us to take the gospel to the nations! And it’s like – I can’t NOT do this it’s this BURNING love. [Ann Dunnagan] that is like I GOTTA do this. [Heidi St. John] Yeah, yeah. And really that’s how his friends described him, that’s how Sierra remembers him. He was so passionate about Jesus. He wanted people to know Jesus the way he knows Him. He wanted people to have that same experience and he said that was his heart right for the Sentinelese People – was that they would know that God loved them. [Ann Dunnagan] I think it’s important for Christians to realize that there are people who have never heard the gospel before. There are many people groups around the world, who are not just nations, but actual like ethnic groups over 11,500 different people groups around the world. But there’s over 3000 that are that are unengaged, unreached people groups. It’s called UUPG – it’s like the most unreached. And this was actually an uncontacted group. So it’s even more remote than that. I just know in the work that we have done around the world people are never better off without Jesus. I mean, we have we have seen places where people worshipped – like in Uganda there was a place where people actually worshipped a large tree and would sacrifice children to that tree. Or, you know, places where there were terrorists doing things and it’s just people around the world who do not know Jesus. They are lost and we just need to have that compassion in our heart to go and to take the Gospel to those. I want to keep bringing people back to: Ultimately we have to we have to listen to and obey the Lord. There are a lot of people said was foolish for Jesus to give up His life. He didn’t have to go to the cross. I remember reading to my daughters the very first time the story of Jesus in the garden of Gethsemane. Basically saying: Lord if it’s your will,l take this cup for me. And he and he did it anyway, and there’s a part of me, and in talking to my daughters and sort of processing this with our children – the struggle I think happens because sometimes we lose sight of eternity. [Heidi St. John] Jonathan never lost sight of eternity. Right? And we’re always telling our children – listen we’re just passing through here. This world isn’t our home. I mean aren’t you glad? I’m glad! I’m more glad every day that this world isn’t my home. Because what we’re doing here we’re doing for eternity. And whether we understand Jonathan Chau’s decision to go over there, or are we even agree with it – as Christians, we should at least be – I hope, that it causes take to take a look back at why he did it and the importance of spreading the gospel. It seems like we don’t in this age of the internet, I kind of feel like somehow we’ve lost sight of the importance of spreading the gospel. If you wanted to encourage a family – that this is how you raise a child that is mission-minded, that has an outward focus. What are a couple of things that you would tell those parents who are listening? And we’re fearful as parents, right? We are! How do you get past that fear and raise a child whose passion for Jesus is going to be the thing that drives him? [Ann Dunnagan] I think it’s important for us as parents to realize we’re not raising our kids just to keep them safe. If we want to raise our children to be mighty arrows for the Lord, then we need to be able to release them into God’s purposes. And, sometimes that may mean our children doing some things that may make us uncomfortable. So I would just say to really encourage parents to raise their children to fervently love Jesus from the inside. That it’s not just legalistic requirements put on top of them, but to encourage and stir up a passionate love and heart for Jesus, personal prayer life, being in the word of God, and to be sensitive. And even just teaching children to learn about different people and people groups around the world. There’s a book called Operation World that is learning how to pray for all the different nations of the world but there’s a brand new children’s version that’s out that’s called Window on the World. They just redid it just like couple weeks ago. But just encourage children to pray for people and to have a heart for not just being selfish. But to have a heart of, you know – do unto others as you would have them do unto you if you. If you were stuck in some tribe where you never heard about Jesus before, and you had no way of hearing the Gospel – wouldn’t you want for someone to share the gospel with you? And that’s how we received the gospel. We receive the gospel from people who risk their lives and people who did daring things. And, I just am very grateful for those who do take risks. [Heidi St. John] Ann, when your children ask you questions like mine did about situations like this… you know, what I told my daughters, and I know Jay was talking to our kids about this or that it at the dinner table – was that ultimately we have to listen to the Lord. We listen to the Lord, we obey the Lord, and we’re going to answer to the Lord ssomeday And people can call his hehavior reckless. And there was a part of me that was just like – Dude you knew. Right? I mean did you feel that way too? [Heidi St. John] Part of me was just like – You knew that this was illegal you knew the risks that you were taking, and he chose to go there anyway. But ultimately, he stands before the Lord. And that’s kind of what we tried to tell our children. We don’t want to be foolish. We’re not sending our kids out into the world to be foolish. You want them to be gentle as a dove and wise as serpent. To be wise about what’s going on around them, but to be driven by their love for the Lord Jesus and our love for other people. And that kind of that kind of passion is what helps people start orphanages around the world. It’s what gets people involved in ministry. It’s it’s why we have so many mission organizations that have come out of places where people have been free to follow and serve the Lord Jesus instead of taking it for granted. We say – Lord what what can I do with this extravagant gift that you’ve given me of a freedom to to serve you with a reckless abandon? And I’m sure you’ve read missionary stories to your kids right? you and I both share a passion for the missionary stories, and reading to your kids – those are simple things, righ? Read to your kids, engage with them about what missionaries are doing around the world – because missionaries are still at work! [Ann Dunnagan] Yes! I have a friend who she actually posted about this whole story and she has been living with her family in Niger, West Africa for 20 years. And she posted the most beautiful picture of all of these. It was a classroom filled with remote ministers from Niger, West Africa that were praying for this people group. The Sentinelese People! They were praying that God would send others into that island, into that unreached people group. Just, you know, the Bible tells us that someday every nation, tribe, and tongue, and people will be before the Lord in heaven. That’s what I want to raise my kids is to be focused on eternity, focused on heaven and what really matters. [Heidi St. John] I love that “focus on the journey”. If any but he’s been doing that with their life – my friend, it’s you. You encourage me! Ann, thank you so much for coming on the show today. It’s always a blessing to have you. If people want to find out more about you – Where can they do that? [Heidi St. John] Are you still doing your podcast? [Heidi St. John] I love it! So, for those of you who want more information about Ann Dunagan and her ministry, I will link back to her in the show notes today. If you have a guest idea or a show idea or you would like your question featured at mailbox Monday please shoot me an e-mail at podcast@thebusymom.com! I hope you guys have enjoyed this today and you have a fantastic weekend and I’ll see you back here on Monday.